Winter is knocking on the door and you will gonna need a fireplace that’s extra cozy and can warm you up in the cold windy nights. 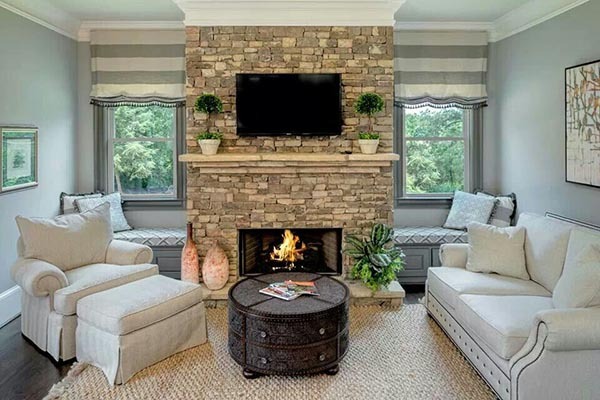 As I am a huge fan of the concept of using the stone material in the interior design, I’d like to show you these stylish stone fireplace mantels. 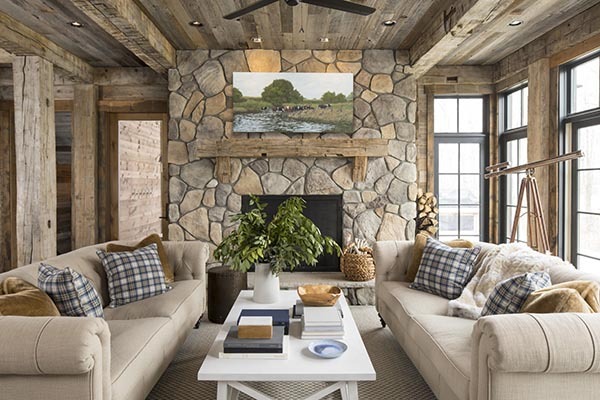 They kind of bring the warm farmhouse vibe to this contemporary living space. Moreover, the stone fireplace with window seats on either side makes you want to lay down with a great book and a cup of hot chocolate! 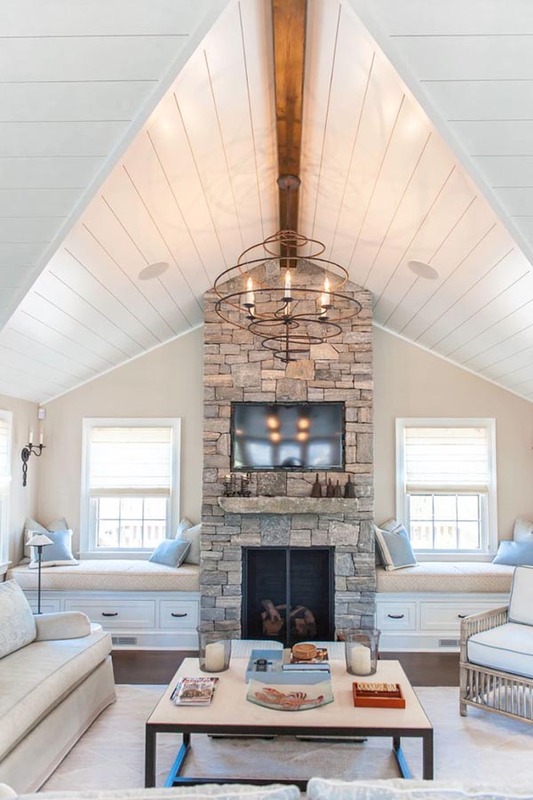 That’s a beautiful living room for a countryside family home – with a traditional stone fireplace with doors on both sides, medium tone solid wood floor, rustic carpet, and leather sofas. 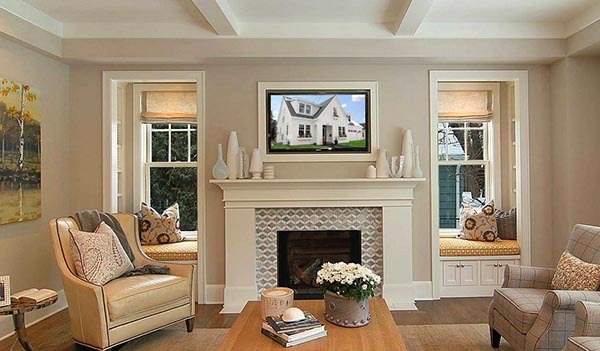 Recently, a friend of mine, who is now refreshing their living room, asked me to share some ideas for window seats on each side of the fireplace in the living room with TV over the fireplace. Here is what I showed her…stunning, isn’t it? While I was searching for some ideas for a fireplace with glass doors on both sides, I found this picture with one glass door and one tall window. It is definitely an interesting touch to this cozy mountain lodge. Do you need to cozy up a simple space? Then, display some minimalist decor to the fireplace mantel, and add some additional fluffy cushions to the sofas and the reading nook around the windows. 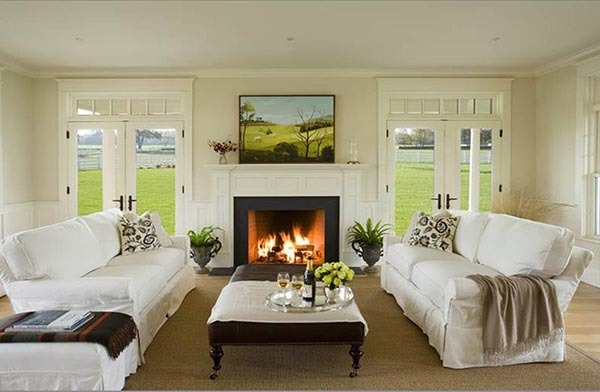 Here is another traditional fireplace between windows idea! 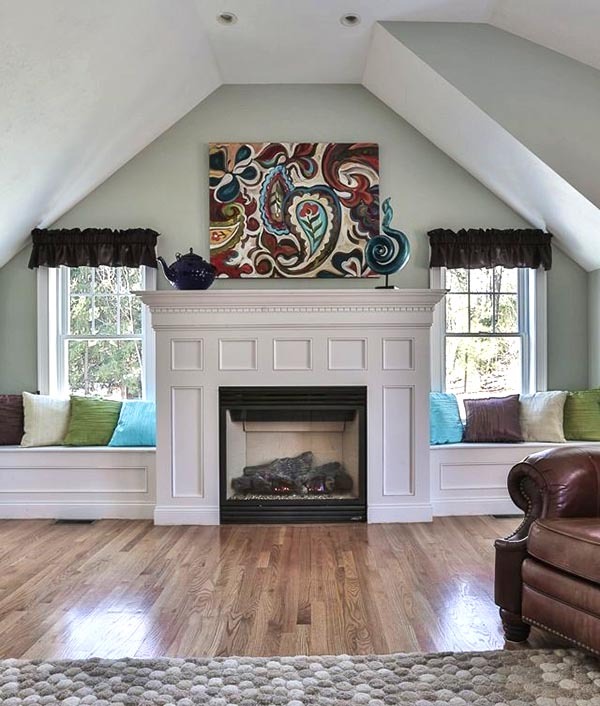 Though the white fireplace mantel is quite simple, the artwork creates texture and dimension and contributes to the rooms overall mellow vibe. Looking for a fireplace with window seats? Why don’t you mix it up? The stone facade here fireplace helps warm up an otherwise all-grey living room. It gives it character and keeps it from being too bare. 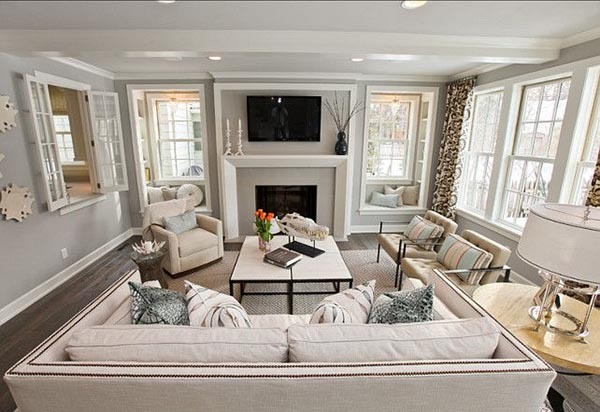 The overall design of this living room is very out-dated and yet warm and cozy. 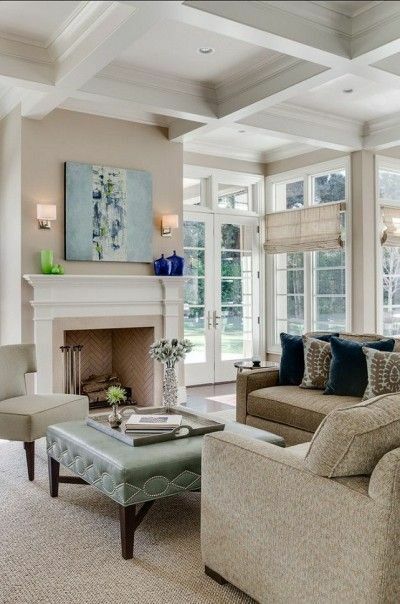 However, the white fireplace mantel gives a timeless look to the whole space. The recipe for a Nordic-inspired living room: fewer colors, minimalist decor, white wooden natural furniture, and fireplace with window seats on each side. This up-to-date fireplace is obsession-worthy, for sure! 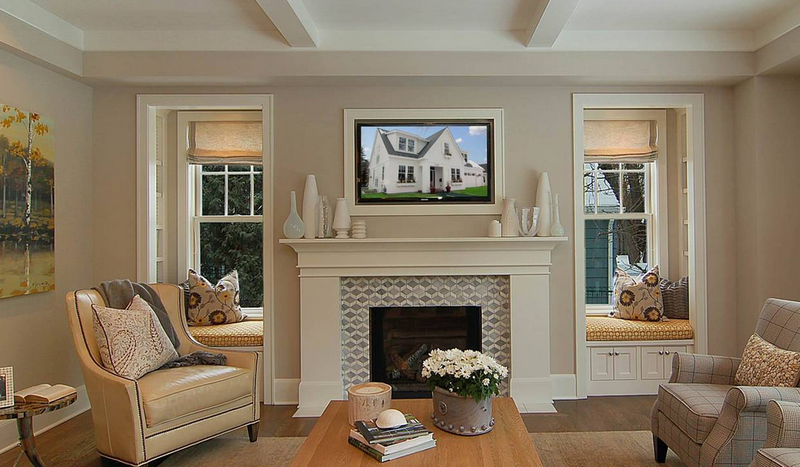 Desperately searching for fireplace mantel ideas? 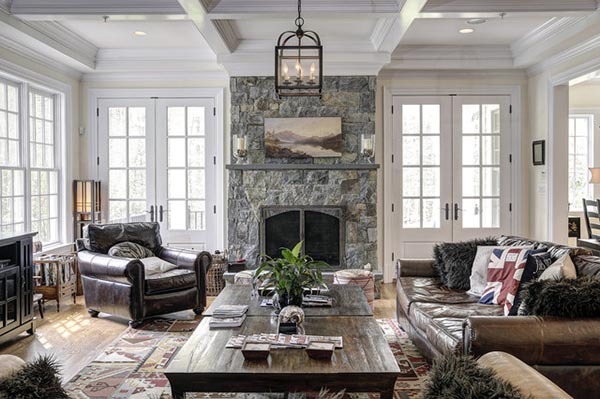 There are so many cool accents in this living room – the fireplace with doors on both sides, the built-in library shelves, the windows, and the high ceiling. All the texture and pattern in this Southwestern living room helps space feel more private and cozy. 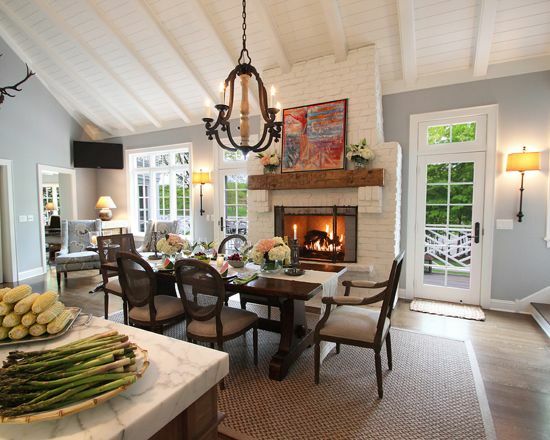 I just love the classic fireplace with window seats on either side. 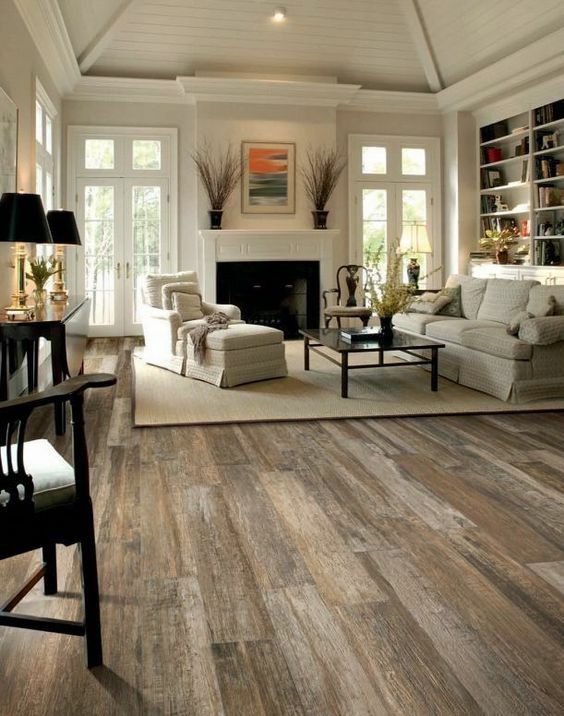 Fireplace tile ideas like this one are getting more and more popular. 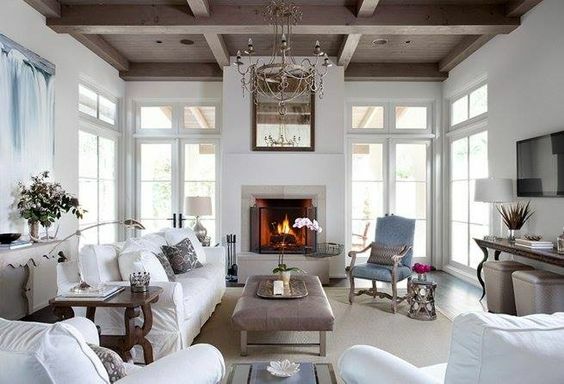 The polished white fireplace adds a nice, modern vibe to this high-ceilinged living space, while exposed tall windows ups the cozy factor. I recently found some pics of rooms with fireplace and permanent window seats, however, I will show you only this one for now. A faux leather armchair, artwork, and a bunch of colorful cushions boost the cozy vibes. However, everything in this picture has been centered around the small table with the enormously big vase, I think the fireplace mantel decor is the centerpiece of this design idea. 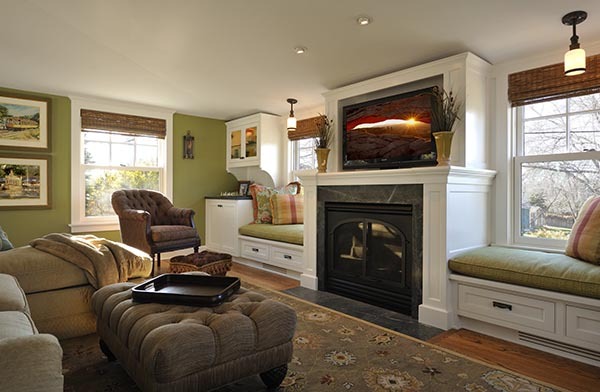 Here is another fireplace hearth with window seats on both sides. I would transform the sitting space into lovely, cozy reading nooks using cushions, blankets, and some simple wall art. The low-relief fireplace mantel is what really caught my eye at first place. However, I like the entire room as it’s very bright and welcoming. This one is for sure one of my most favorite fireplace mantels ideas! I just love everything about it – the contrast in the paint colors, the sitting area, the rustic lamp, and the piece of art above the mantel! Here is another beautiful classic fireplace with doors on both sides. 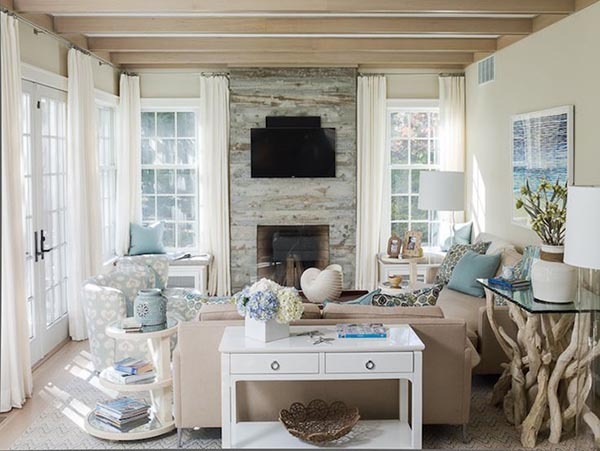 It perfectly fits the overall interior of this coastal living room. 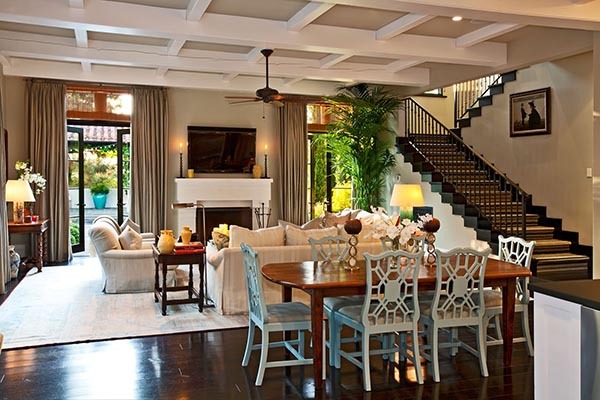 In this picture, the fireplace mantel decor has a dramatic impact on the whole high-ceiling living space. Hang a luxurious-looking mirror above your fireplace mantel – it will give some additional polish to your living room, or help space feel more spacious if you’re working with a small room. It’s simple, but it works every time – frame your fireplace mantel with vase or candles on each end. The combination of blue, white and wood is timeless and cutting-edge. If you are looking for some fresh fireplace mantel designs, take a look at this statement-making piece among the patterned curtains, vibrant cushions, and fancy Portuguese style pottery. Gray-green and white is the color combination that literally never fails. The fireplace with window seats on each side became part of the wall decor by using a similar tinge. 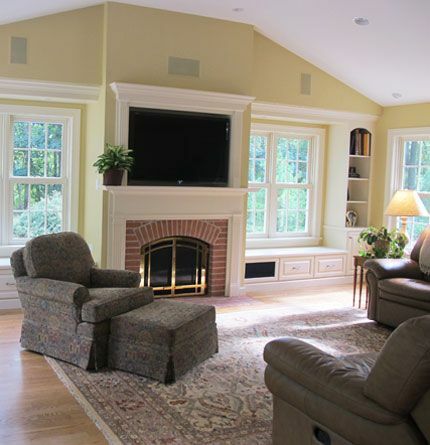 This caramel color fireplace mantel is truly the centerpiece of this beautiful high-ceiling living room. The tones of the overall design are so soft and silky. Do you like the stone fireplace with glass doors on both sides? No matter the design you choose – minimalistic, luxurious, modern or classic, the truth is the mantel can say a lot about your personal style and taste. So, do not rush, take a deep breath, and make the right choice for yourself.